What’s Your Moment of 2012? At the end of the year it’s customary to look back: and this year it’s easier than ever. Have you reviewed your Year On Twitter or Biggest Moments on Facebook yet? Last month I posted my 12 of 2012: one photo taken each month in my phone’s Photo Stream. It’s one way to review the year. That came from a conversation where I asked “what moment will you remember from 2012” and I ended up looking at pictures from the year. Of course those 12 photographs don’t answer my own question. Normally, I would find answering that difficult but this year it’s easy. There’s one moment that really sticks in my mind from 2012: unlike most years I do not have to think or delve into my memory banks: it’s just there. One moment in – as the cast of Rent might say – “Five hundred twenty-five thousand Six hundred minutes”. It’s Monday 23rd July 2012 and I was lucky enough to get a ticket to the Olympic Stadium rehearsal for the London 2012 Opening Ceremony. 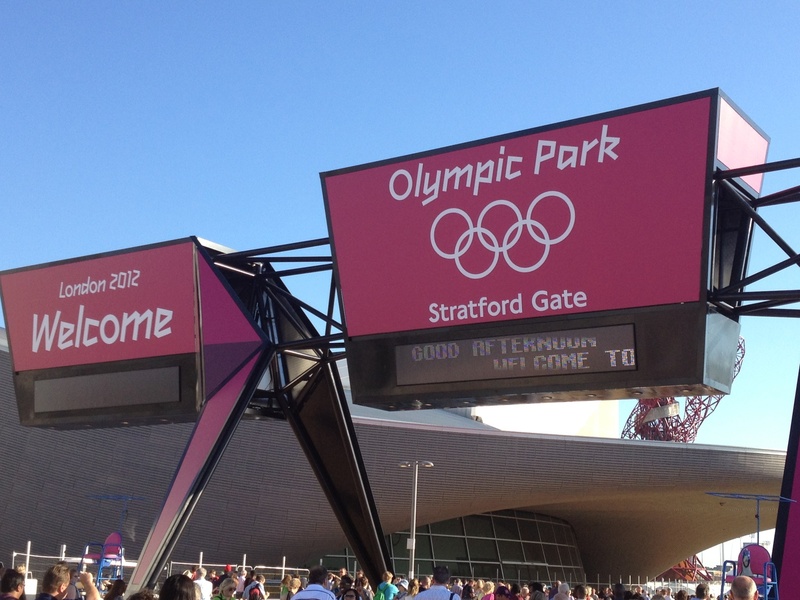 It was all very last minute but it was a glorious evening in London and I made my way across the city to Stratford and the Olympic Stadium. 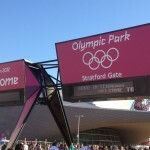 Entering the Olympic Park and seeing everything ready was a special moment but the best was still to come. Sitting in the Olympic stadium awaiting the rehearsal we were all urged to #savethesurprise (and that was perhaps the cleverest Twitter hashtag of the year, allowing the audience to use social media and share the moment by using a reminder not to over share). The centre of the stadium had been converted into England’s green and pleasant land (there were 40 sheep, 12 horses, 3 cows, 2 goats, 10 chickens, 10 ducks, 9 geese and 3 sheep dogs are involved). Fluffy clouds were being walked around what, underneath the greenery, was the athletics track. It was tranquil, a little odd and most intriguing. There was a real sense of anticipation as the excited crowd both wondered what was about to happen and, most of all, if we were going to be able to do something that would live up to a nation’s expectations. We knew that most of the 7,500 taking part were volunteers and they’d been rehearsing for months but we’d no idea if London could pull off something memorable. The pastoral scenes in front of us, while fascinating and – perhaps – uniquely British, were not quite a spectacle. 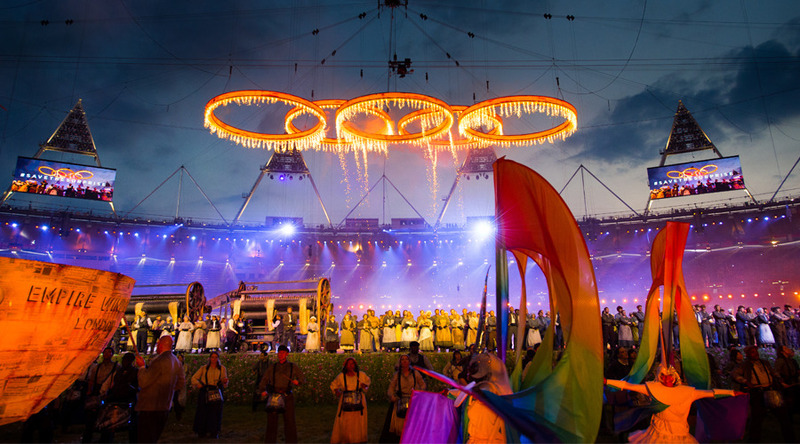 Then about 10 minutes into the event Isambard Kingdom Brunel ushered in a celebration of the Industrial Revolution in a section entitled Pandemonium which lead to the casting of the Olympic rings and one of the iconic images of the games. At the start of Pandemonium 965 drummers accompanied the non-stop beat on The Underworld soundtrack. Sitting in the audience, the drums began behind you as the musicians marched into the stadium. The television soundtrack doesn’t do the noise justice: the beat reverberated around the stadium and right through you; I’ve never experienced anything like it. It was the moment; an amazing moment – the crowd erupted and it was the point when we realised that London could and would deliver. It was the second the crowd knew that it would be an incredible year.